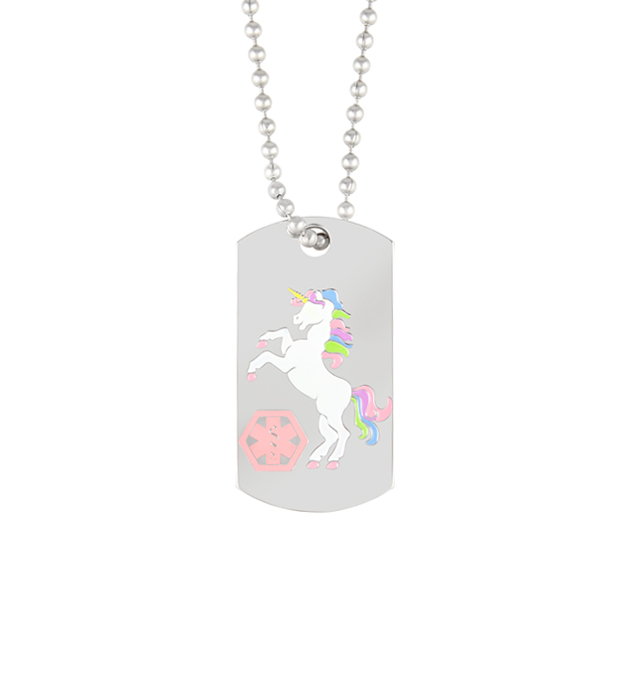 Bring a little magic and fun to your medical alert necklace with our Unicorn Medical ID Dog Tag! This custom-engravable, stainless steel medical ID pendant is a Lauren’s Hope exclusive, featuring a beautiful unicorn and a pink medical caduceus symbol on the front, which serves to alert first responders to your medical information, which we will custom engrave on the back. A fun twist on the classic stainless steel dog tag, our Unicorn Medical ID Dog Tag is water resistant and scaled down for a kid-friendly style. This medical ID necklace measures 18” and is easy to cut down to size for use as a backpack loop. Whether you or your loved ones wear medical IDs for drug allergies; food allergies such as peanut, tree nut, soy, or wheat allergies; adrenal disorders such as adrenal insufficiency or Addison’s disease; or for any other medical condition or treatment consideration, medical ID necklaces are an excellent option. Easy to wear and comfortable under or over a shirt, medical ID pendants and dog tags are a great choice for those with dexterity challenges as they can be slipped over the head without unclasping and reclasping.